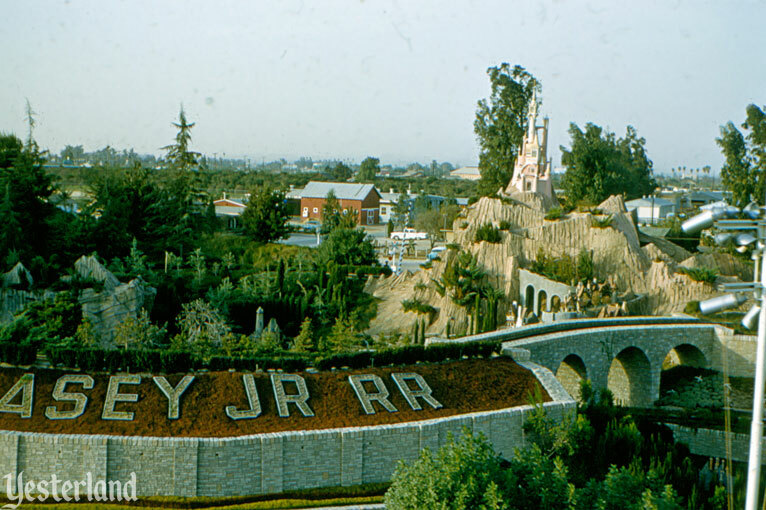 Here at Yesterland, there’s a ride that provides an overhead view of the intricate miniature buildings and landscapes of Storybook Land—not the water-level view from the Storybook Land Canal Boats or the slightly elevated view from the Casey Jr. Circus Train enjoyed by Disneyland guests. 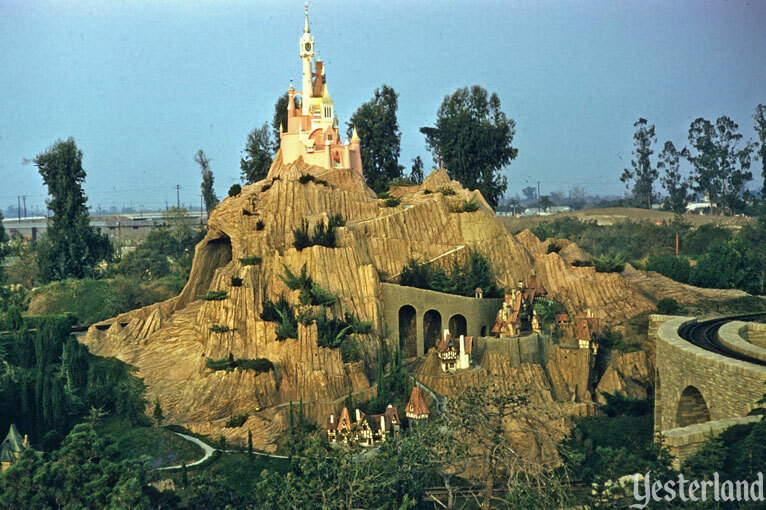 There are actually two such Yesterland rides—if you count the Skyway to Fantasyland and the Skyway to Tomorrowland separately. Welcome aboard Yesterland’s Skyway. Frankly, you won’t see much of the little cottages from up here, and Cinderella’s Castle loses much of the forced perspective that makes it look bigger than it really is from down below. 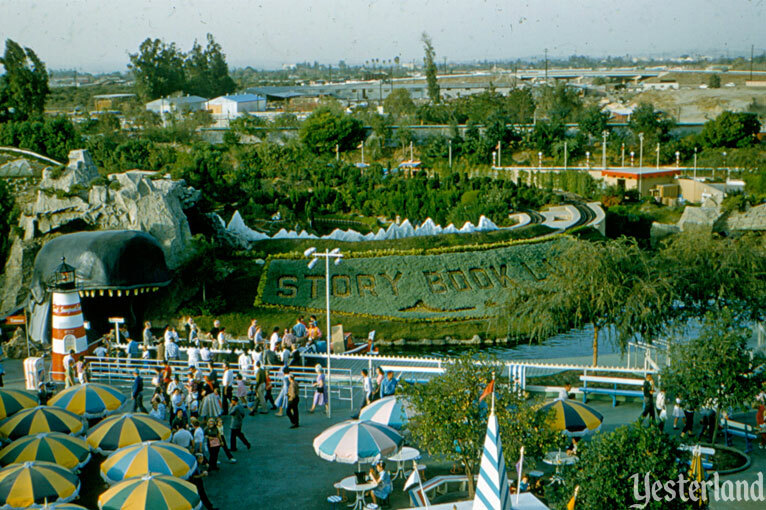 But you’ll get a great overview of Storybook Land as a whole. You can also take in the view beyond the berm of the park. This park is located in a primarily agricultural area. There are residential areas to the north. Good luck finding anything more that two stories high—unless you want to use “stories” to measure the height of the eucalyptus windbreaks that separate the orange groves to the east. There’s a good view of the queue for the Storybook Land Canal Boats from up here. Guests who don’t have a “D” ticket left in their ticket books can buy their ride tickets at a ticket booth that looks like a traditional red-and-white-striped lighthouse. 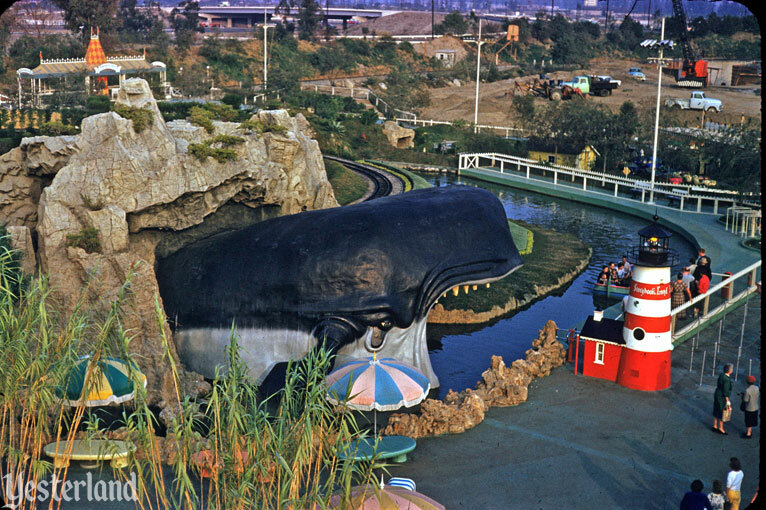 Then they board a boat right in front of the gaping mouth and menacing teeth of Monstro the Whale from Pinocchio. The little yellow barn near the canal is part of the Midget Autopia. If they ever get rid of the Midget Autopia, that might be a good place for the Storybook Land Canal Boats queue. 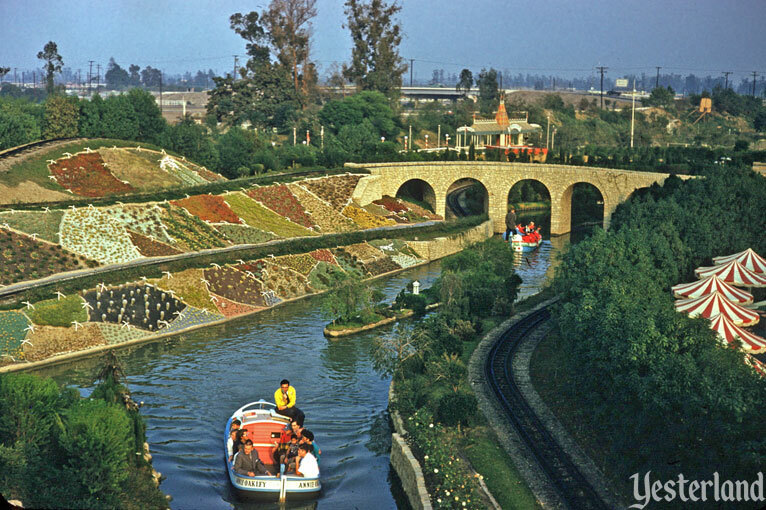 At Disneyland, the Storybook Land Canal Boats and the Skyway had a lot in common. Both opened within days of each other—June 18, 1956 for the former and June 23, 1956 for the latter. ANAHEIM, Calif. (AP)—Walt Disney, who once labored over a mouse, can now move mountains. And he’s having the time of his life. Nobody ever had a realm like Disney’s. His sprawling wonderland for the young and old, Disneyland, is now getting ready to celebrate its first anniversary, and Disney is supervising a million and a half dollars worth of improvements. It’s an experience to tag along after the movie wizard—you have to hustle to keep up with him—as he surveys the park. He started in front of the city hall of the Main Street Circa 1890. Then away we go! Disney strode straight through the towering castle of Sleeping Beauty and into Fantasyland. He walked into a construction zone where a huge whale gaped menacingly. Then he climbed up a small hill and viewed what the canal boats will see. Craftsmen were meticulously creating miniature villages from Pinocchio, Alice in Wonderland, Three Little Pigs, Cinderella and other stories. “Isn’t that Dutch village too low to see from the boat?” Disney called to a supervisor. The man adjusted a platform to simulate the boat level. Disney sat on it and assured himself the village was high enough.” But raise that bridge or it’ll be too much under the water,” he added. Pressing into Frontierland, he explained the workings of the mine ride, which will take people through the mines and canyons of the old west and then through a series of spectacular waterfalls. The new topography, which will be used for the stage coach and mule trains, includes an unnatural natural bridge and numerous peaks. Disney took a swing around the riverways of the world, along which the steamboat Mark Twain plies. He gazed proudly at the huge boulders that dotted the shores. Storybook Land, inside Fantasyland, is one of Disneyland’s finest examples of the Disney magic in artistry and the creation of unique and entertaining attractions. A kingdom in miniature, Storybook Land presents life-like re-creations of villages, castles, houses and other buildings from the pages of fabled stories—scene after scene of painstakingly detailed settings. If you’ve ever wanted to actually see, from close up, Geppetto’s Village high in the snow covered Alps; Kensington Gardens from the story of Peter Pan; the straw, stick and brick houses of the Three Little Pigs; and the Crazy Quilt Country from “Wynken, Blinken and Nod,” they’re all there—along with many more—in Storybook Land. Gaily painted, picturesque European canal boats take visitors through the mouth of Monstro the Whale into this wonderful world. Fantasyland is literally alive with activity. 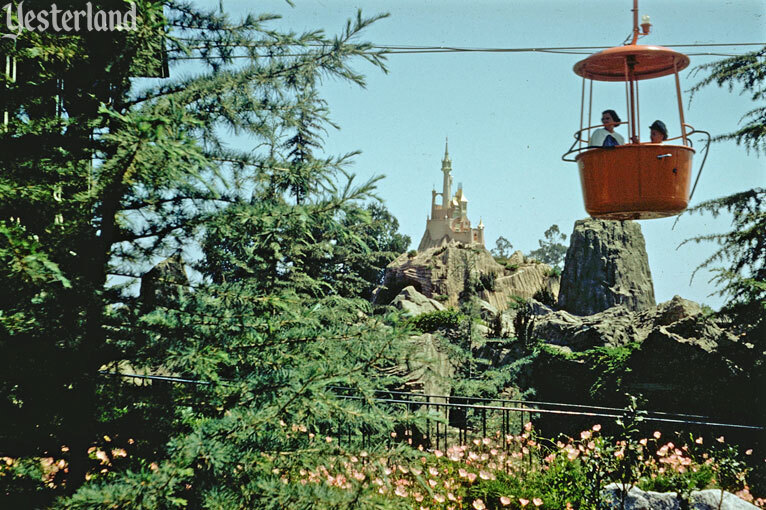 From the Swiss Chalet, the exciting Skyway carries its passengers high above Disneyland to Tomorrowland. 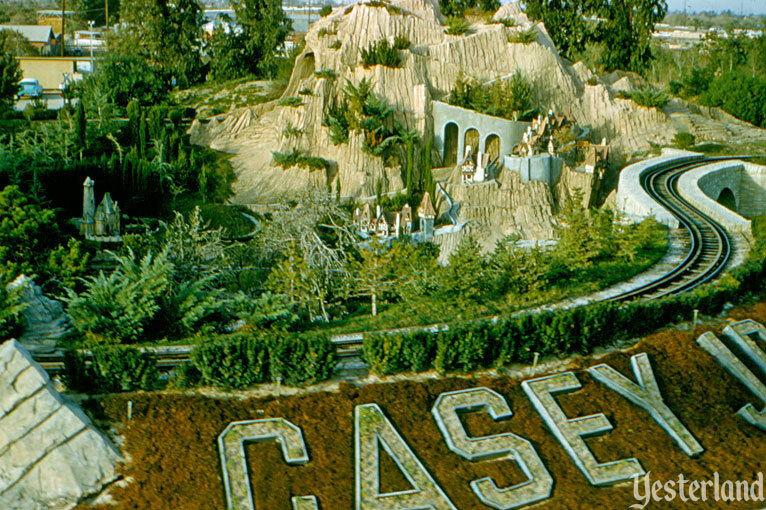 Below, the unique cars of Casey Jr. train huff and puff up hills and down, over bridges and through valleys. 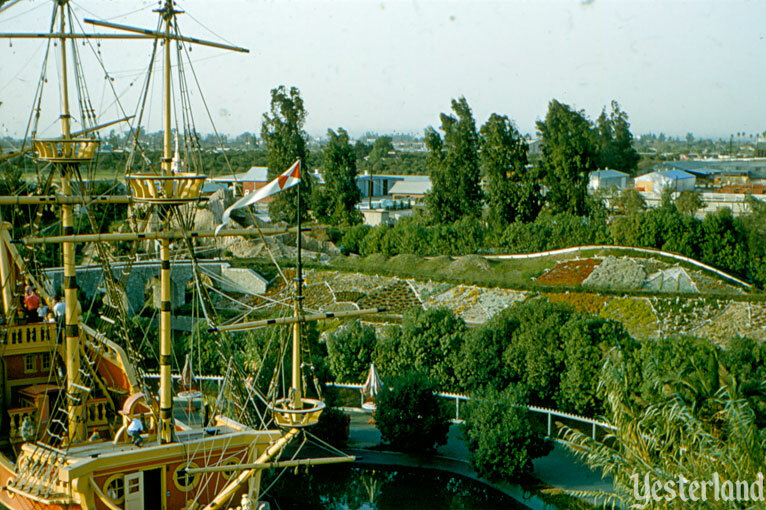 The Skyway carried its final guests on November 9, 1994, but Storybook Land continues to delight guests five decades after it opened. Landmarks from The Little Mermaid, Aladdin, and Frozen have joined the classic miniatures that received Walt Disney’s personal attention. But why are the village and the Beast’s castle from Beauty and the Beast missing?